Until two weeks ago, Alberto Galante had never been to Russia. The 2018 FIFA World Cupdrew him to Moscow, St. Petersburg, and Rostov-on-Don, where he cheered on Mexico’s national soccer team as they advanced through the competition. While Galante—who traveled with his son and friends—was thrilled to see Mexico stun the world in its upset win over defending World Cup champion Germany, that was not the only happy surprise of his 12-day trip: He also got to see living, breathing Jewish life in Russia, which not only left him impressed, but inspired. There are at least 10,000 Israelis among the 1 million soccer fans who have descended upon Russia for the World Cup, but that number does not reflect the thousands of Jewish visitors who have come from all around the world, especially from Latin America. They are also directed by apps released for iPhone and Android devices, and a website with all relevant Jewish tourist information, set up to orient visitors. Weisberg met with FIFA president Gianni Infantino in the runup to the games, sharing with him the Jewish community’s World Cup plans throughout Russia. MJCC, the seven-story heartbeat of Jewish life in Moscow, has a dedicated, multi-lingual information center for visitors, and is home to multiple kosher restaurants, including Shtetl. A pleasant outdoor restaurant seating area with screens showing games throughout the country has been set up on the property of the Jewish center, where fans are able to sip a kosher cappuccino while keeping up with the matches. Since the start of the games, each Shabbat has seen hundreds join for big Shabbat meals, and more than 1,000 are expected for the Shabbat before the finals. While in Moscow, Galante and his group were able to visit the Jewish Museum and Tolerance Center, down the block from the MJCC, and take in a meal at the JerusalemRestaurant—known for its rib-eye and lamb chops—on the rooftop of Chabad’s Bolshaya Bronnaya Synagogue in Moscow’s center. But it was Galante’s visit to Rostov, where Mexico beat South Korea, that struck him most. “Where else do you meet a Jew who made the decision to have a brit milah at age 63?” he marvels. In Rostov, Galante met many more Mexican Jewish fans, some of whom he knew and others he didn’t. Rostov’s restored synagogue is just across the Don River from Rostov Arena, where the games are being played, making it a convenient stop for Jewish visitors. Galante stayed in a hotel quite a distance from the synagogue, and so on Friday night—while some 100 guests gathered for a large meal and farbrengen at the synagogue—made kiddush in his room on wine provided to him by the rabbi. The next day, he walked an hour-and-a-half, joining others for a Shabbat meal at the rabbi’s home. Aside from Mexican Jews, Danzinger says groups have come from Brazil and Uruguay, as have Israelis, who can easily make the two-and-a-half hour flight from Israel to watch Iceland play Croatia. Rostov was for a time the headquarters of the Lubavitch movement, and final home of the fifth Rebbe, Rabbi Sholom DovBer Schneersohn, who passed away and was buried in Rostov in 1920. Many visitors have taken advantage of their proximity to the holy site and gone to the city’s old Jewish cemetery to pray at the gravesite. Two thousand miles separate Kaliningrad, Russia’s European outpost, and Ekaterinburg, its gateway to Siberia. 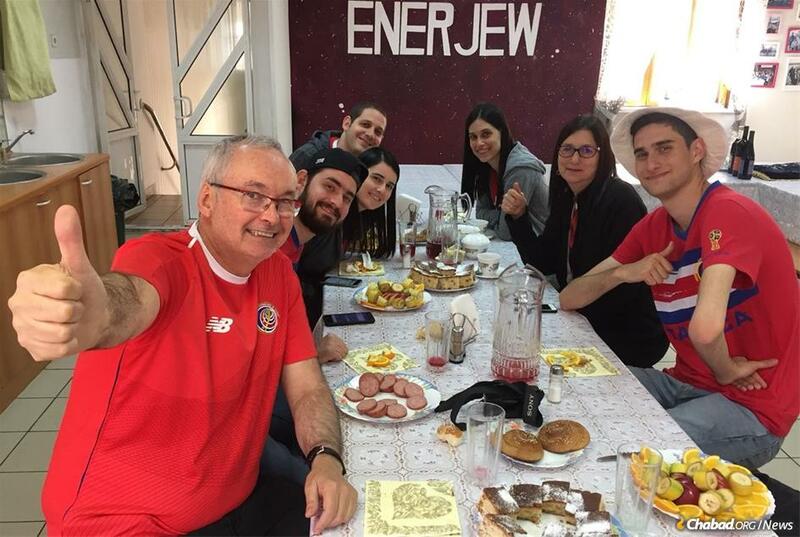 In both cities, Chabad emissaries have opened their doors to welcome Jewish fans. Since 1998, Rabbi David and Avital Shvedik have been a key part of reestablishing Jewish life in Kalningrad, which was the East Prussian city of Königsberg until the end of World War II. The city has a long and lustrous Jewish history, but was utterly destroyed during the war. The choral synagogue was ravaged on Kristallnacht, and the Jewish community deported in 1942. Recently, the Jewish community received the land upon which the choral synagogue once stood, and a full reconstruction of the historic structure is underway. A new 23-ton dome was lowered onto the structure earlier this year, which is timed to be completed this November—80 years since the events of Kristallnacht. “We have been seeing a constant stream of visitors coming in for kosher food and to put on tefillin,” says Shvedik, who notes that Kaliningrad, a Russian island of sorts, almost never gets foreign visitors. At the other end of the World Cup map, in Ekaterinburg, Rabbi Zelig Ashkenazi, the chief rabbi of Russia’s fourth-largest city, has experienced a similar phenomenon. Ekaterinburg’s impressive Rohr Chabad community center is located in the center of the city and includes a synagogue, men’s and women’s mikvahs, and a soup kitchen. Chabad in St. Petersburg has seen a constant stream of visitors to its Choral Synagogue, as has Chabad in Samara, which, together with Chabad of Uruguay, released a short video inviting Uruguayan Jews to visit Samara’s towering synagogue and Jewish community center.